Hiya there, Roxy here!! Mommy and I agreed that it would be fun for me to take you through a day in my life. How exciting will that be? 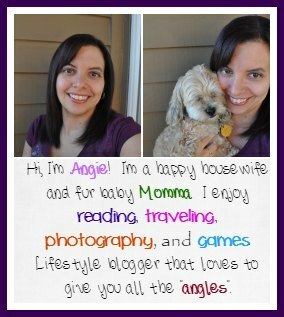 I’m all a pitter patter to take you through a day in my little life with Mommy and Daddy. So take a seat and come along with me on A Day In My Life! Sidenote before I get started: I know I have a pretty good spoiled life, but if you guys EVER tell Mommy and Daddy just how spoiled I am I will find you and ruin you. I like Mommy and Daddy to think that I am a poor abused puppy that never gets anything. I have them wrapped around my little paw. Let’s keep it that way. Okay, moving on! 6:30am – Daddy’s alarm starts to go off. And goes and goes on and on some days. I just want to tell Daddy get up already, that noise is annoying and I need to sleep here. I cuddle back in tight to Mommy as Daddy gets up to go downstairs to shower and get ready for his day. 7 to 7:15am – Daddy comes back up to Mommy and I to give me some tummy rubs and kisses while he kisses Mommy’s face. He tells me you be a good girl for Mommy okay, as he rubs my ears some too. I am thinking okay Daddy, I know you have to go to work, so just go already so I can get back to sleep since you are not staying home to bring me down with you. 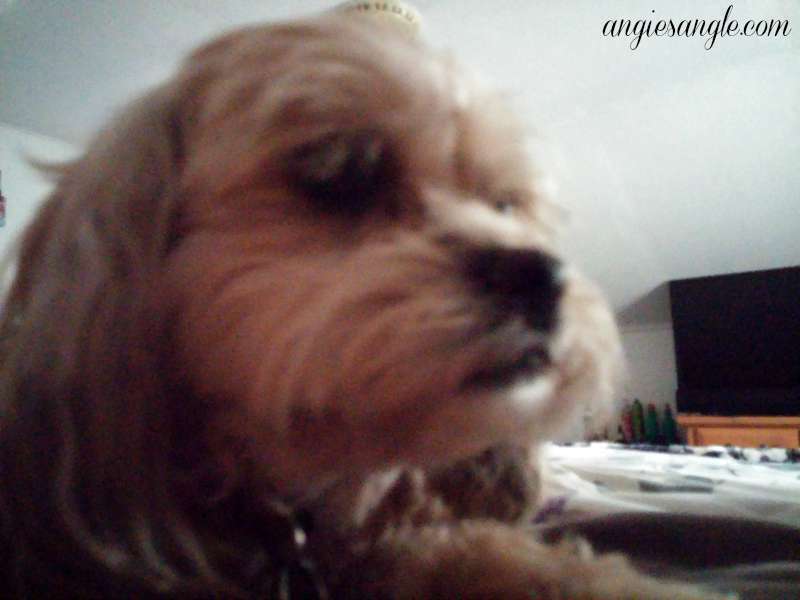 Mommy was trying to capture my Morning Loving, but I am too antsy and it turned out blurry. Sorry Mommy. 9am – Mommy’s awake. Yay!! Most days I am so excited when I see Mommy’s awake. I crawl onto her chest and give her all sorts of kisses as she pets me and loves on me. Mommy pets me a bit and then gets up to go into the potty and back into grab her kindle and water. She first heads downstairs without me and I wait and I wait patiently for her to get back. I hear her come back up the stairs and I get all excited, but first Mommy goes back into that bathroom and I wait some more. Come on Mommy! Oh did you know I won’t go down the stairs? They are some scary stairs, Mommy or Daddy must take me down and I very rarely will go up them. Those stairs are scary stuff! There is Mommy. She comes around to me and shuts off the noise coming from her bedside and pets me and asks me if I am ready to start our day? I say of course I am Mommy, let’s go!! She grabs me and her phone and down we go. 10am – depending what time Mommy and I get up and how long it takes for us to get back downstairs for the morning. Mommy walks around and opens blinds as she works her way to me to let me outside to go potty and bark and let everyone know I am awake and they need to visit me and play some. I bark and play and go potty outside for a bit. I then come back in and it’s time to cuddle in with Mommy for some morning cuddles. I love our morning cuddles and I won’t do them in that warmer weather, it’s just to warm for me then. But give me Mommy’s lap once that cooler morning hits. I cuddle with Mommy for a bit and then as she starts to move and do others things, move to beside her or Daddy’s place on the couch. I occasionally see something outside I have to bark out, after all what kind of guard dog would I be if I didn’t? Weekdays are pretty quiet with just Mommy and I here. I love Mommy, but she is always on this laptop thing and typing away. I never get anything. I go outside maybe once or twice during our day and I don’t do much else. Sometimes Mom and I’ll go outside to sit and she’ll throw the ball for me. Boy is that fun! She also brings out my bowl and I chow down on Purina ProPlan Bright Mind some, but for the most part, I only eat in the evenings. 5:30pm – Oh Daddy’s ringtone comes on Mommy’s phone!!! That means Daddy is almost home for the day and I couldn’t be more excited! 6pm – Daddy’s home! I tell Mommy that Daddy is home, let’s go greet him! Mommy opens the door for me and out I dash first into my princess castle (my bush in the corner) and then over to Daddy, who is taking forever to get out of that car. I’m so excited when Daddy gets home for the day. Daddy and I play some and I am just a happy dog, my Daddy is home! 6:30pm – it’s bone time. Mommy gets my dental chew for the evening and sometimes I eat it right away, but sometimes I hide it somewhere around the house so that I can eat it later when I want it, don’t want Mommy or Daddy stealing my bone. Yum bone! Evening – Mommy and Daddy play with me and I finally start eating my meal for the day. I like to play some and then eat my fill of my yummy food. How do you eat? What do you eat? 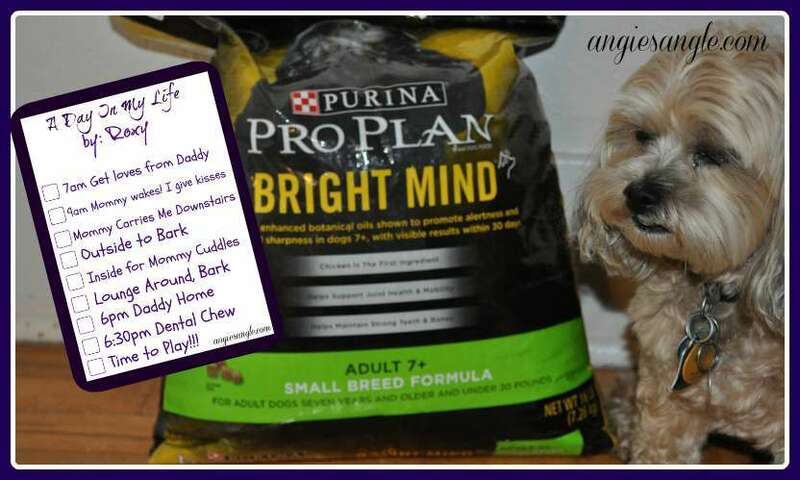 Lately, Mommy has given me the Purina ProPlan Bright Mind and I have enjoyed that greatly. 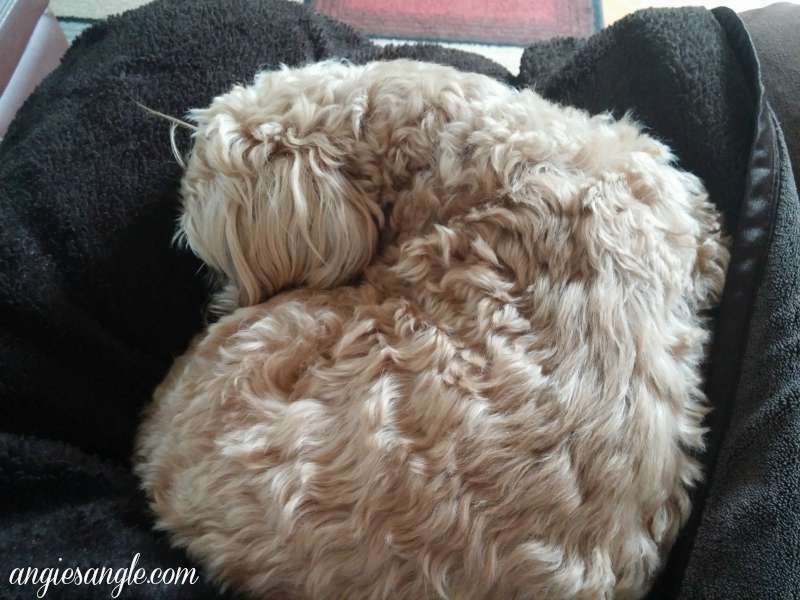 Did you see the post where Mommy found this amazing dog food over at PetSmart last month? It’s just grand and made especially for me, how great is that? 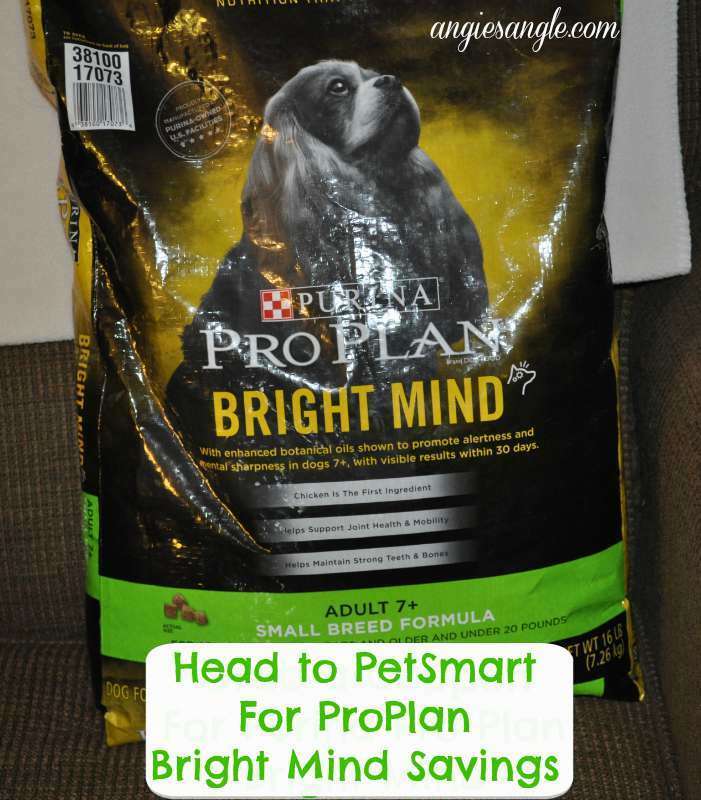 Purina ProPlan Bright Mind is enhanced with botanical oils which are shown to promote alertness and mental sharpness in dogs seven and older with visible results within 30 days. The botanical oils help promote memory, attention and trainability. Dogs that are 7+ are considered senior; I’m considered a senior dog, can you believe it? I’m 8 1/2, but everyone that sees me says no, you can’t be and I proudly state yes I am. I’m just a senior in a puppy body, am loving it! 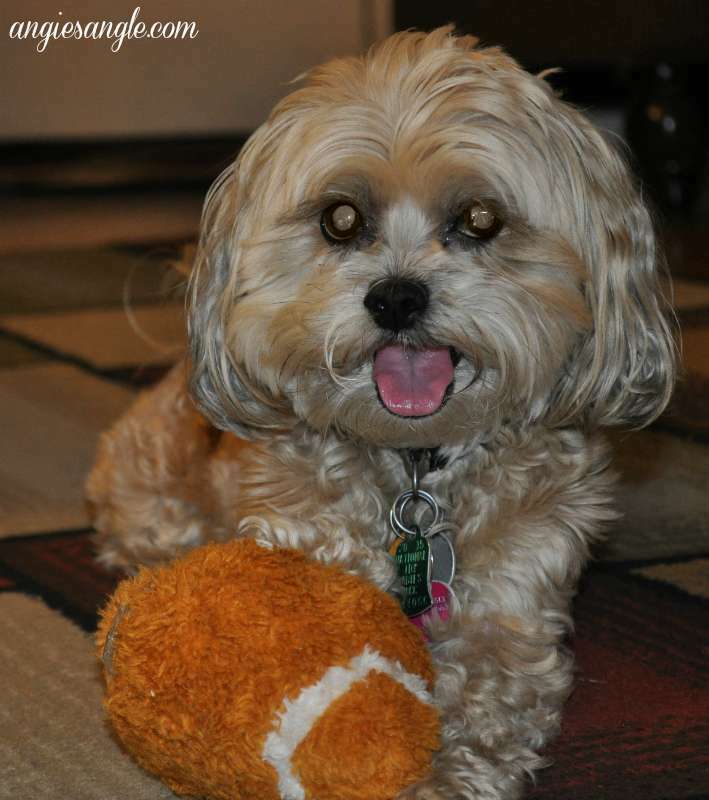 You too can try the Purina ProPlan for your fur baby like Mommy did for me. Now if you Spend $10 on any Purina ProPlan Dry Dog or Cat Food* at PetSmart between 8/31 and 10/4, you can save $10 on your next Purina ProPlan Dry Food purchase, 14-lb. or more, on or before 11/1. Head into PetSmart today to take advantage of this amazing deal! You don’t want to miss out on it. The rest of my evening is spent playing and cuddling. 9pm – I am ready for bed, so I crawl into my chair into the second living room to wait for Daddy to be ready for bed too. Daddy takes me up to bed each night, so I gotta be patient and wait for him. How does your doggy spend their day? I’d love to hear all about other doggies way of living. I say I do have the life some dogs dream of. Do you have a senior puppy too? What kind of things do you do with them to get them active and happy? Until next time, Mommy’s World.